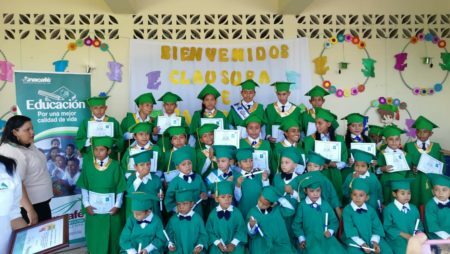 Parents, teachers and students celebrated the 2018 graduation of the third class of Sexto Primaria of the Mojarras Mixed Rural Private School in Coatepeque, Quetzaltenango, Guatemala. The school is the result of an alliance between BANASA and Funcafé that began in 2010 with the purpose of raising the quality of education in rural areas of Guatemala Southwest. The students enrolled in the Mojarras School are all children of BANASA employees. The school uses a proven teaching method that focuses on the student – addressing not only their academic performance, but also their role in their social and natural environment. The school was founded to provide a better academic level in the area, contribute to community development and provide more opportunities for the local children. Many rural and indigenous children in Guatemala do not have the opportunity to get an education, as they have to work to assist their families’ survival. Of the 2 million children in Guatemala that do not attend school, the majority are girls living in rural areas. “At the Mojarras School we provide a quality education for both girls and boys. We encourage all children to take advantage of this opportunity to get a good education, as well as learning leadership and life skills. A well-rounded education empowers girls in more ways than just learning to read and write,” stated Bernhard Roehrs, corporate director of BANASA. The school strives to stay up to date with the latest educational developments and uses innovative techniques and methodologies based on an immersive experience centered on the student and his or her place in the community. This student-centered instruction is a holistic approach focused on skills and practices that enable lifelong learning and independent problem-solving. The curriculum includes teaching human values and emphasizes the learner’s critical role in creating meaning from new information and prior experience, within the framework of their own lives. It’s proven that access to education empowers girls and gives them an alternative to the traditional expectation. Parents are involved through their participation in the various activities at the school throughout the year and the parents of the students who graduated this month had reason to celebrate – they saw the results of their children’s hard work and commitment.